The thrilling beauty of the Galápagos Islands and the rediscovered jewels of the Inca Empire await you on this tour through the Galápagos and Peru. GL. 18 night tour. 2 nights Lima, 1 night Paracas, 1 night Lima, 1 night Sacred Valley, 1 night Machu Picchu area, 2 nights Cusco, 2 nights Puno, 1 night Lima, 2 nights Quito, 4 nights Galapagos Explorer II, 1 night Guayaquil. From the ancient ruins and fascinating culture in Peru to the amazing wildlife in the Galápagos Islands, for seasoned travelers looking for a new adventure, this tour is not to be missed! Arrive in Lima where you will be met and transferred to your hotel by your Tour Director. This morning, your Local Guide focuses on the city’s colonial heritage during a walking TOUR. Start at the Plaza de Armas to see the Government Palace and the Cathedral. From here, stroll to the venerable SAN FRANCISCO MONASTERY with its splendid 17th-century cloister murals. This evening, meet your Tour Director and enjoy a welcome dinner with your fellow traveling companions. Enjoy a scenic drive south along the Pan-American Highway to the town of Ica, the wine capital of Peru. Have your camera handy today as you board your aircraft for a FLIGHT over the Nazca plains, which can only be appreciated by air. Your pilot will point out the mysterious markings known as the NAZCA LINES, a series of drawings of animals and geometric figures etched into the parched soil—some up to 1,000 feet long! Theories vary, but the most accepted belongs to German mathematician Maria Reiche, who dubbed the land the “astronomical calendar” of the ancient Peruvians. Enjoy dinner this evening at your hotel. Head north to the Bay of Paracas. CRUISE out to the Ballestas Islands, which are inhabited by a wide variety of sea mammals and exotic birds, including boobies, sea lions, and Humboldt penguins. The huge Candelabro, a candelabra-shaped etching on the Paracas cliffside, can also be seen as you cruise back to shore. Board your motorcoach and arrive in Lima by late afternoon. Tonight, enjoy a dinner at a local restaurant accompanied by an ANDEAN FOLKLORIC SHOW. Fly to Cusco, the impressive Andean city that was once the capital of the Inca Empire. 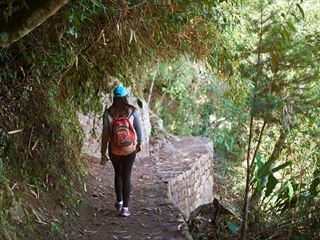 Spend the day in the Sacred Valley of the Incas with a visit to the semi-circular KENKO Amphitheater with its stone altars and labyrinth of passages. See the ancient site of PUCA PUCARA before reaching the TEMPLE OF SACSAYHUAMAN, perched on a hillside overlooking Cusco. It remains unfathomable how and when this fortress of gigantic stones—with some blocks weighing more than 350 tons—was built. 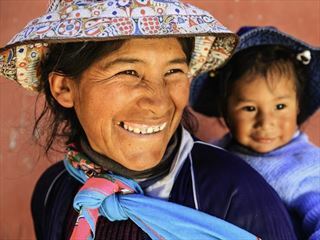 Next, visit PISAC, an old mountain village where you will have free time to shop for local wares such as alpaca sweaters and blankets, jewelry, or hand-painted ornamental dishes and vases. Later, visit the Inca Fortress of OLLANTAYTAMBO followed by the opportunity to visit a home, meet some of the locals, and experience their way of life. Stay in the Sacred Valley tonight, with dinner at the hotel. This morning, board a TRAIN for a short journey through the lush Urubamba Valley. Then, transfer to a motorcoach for the ascent to legendary MACHU PICCHU, the “Lost City of the Incas,” high above the steep valley overlaid with dense tropical jungle. Your Local Guide will bring you closer to the lives and mysteries still hidden in these amazing structures built by the pre-Columbian masters of this sacred land. Tonight, stay at a nearby hotel. Your entrance to MACHU PICCHU is included for a second day. Enjoy the tranquility of the morning with free time to wander the ruins at your own pace and experience the magic that is Machu Picchu. After lunch, return to the Sacred Valley by train and continue on to Cusco. This morning, learn more about the Incas and their struggle against invading Spaniards on your Cusco city TOUR with visits to the imposing CATHEDRAL and the SANTO DOMINGO MONASTERY. The remainder of your day is free to explore at your leisure. Board a flight to Juliaca, where you will continue to Puno on the shores of Lake Titicaca. Today, take a motorboat trip to some of the more unique islands of LAKE TITICACA. Start with TAQUILE ISLAND, which was once part of the Inca Empire and was one of the last areas of Peru to be conquered by Spain in the 16th century. The Spanish banned traditional dress on the island, which is why the Spanish peasant dress can still be found today. Next, travel to the fascinating UROS ISLANDS, home to the Uros Indians, who were forced to live on the lake as the Inca Indians pushed farther into their territory. These islands are completely made by reeds and are continually added to as they disintegrate to the bottom of the lake. Later, your Tour Director hosts a memorable farewell dinner. Depart for Juliaca this morning, visiting the ruins of SILLUSTANI en route. At this pre-Incan burial ground, see where the ancient Aymaras buried their high priests in chullpas—above-ground, cylinder-shaped tombs dating back to the 1400s. Fly from Juliaca to Lima this afternoon. Fly to Quito, the capital of Ecuador. Overnight in Quito. Fly to Baltra and transfer to Santa Cruz Island, where you will visit the CHARLES DARWIN RESEARCH STATION, home to famous “Lonesome George,” established to help conserve the Galápagos’ natural habitats and protect the area’s famous giant tortoises. Next, board the Galápagos Explorer II for your 4-night Galápagos Islands CRUISE. With Globus, enjoy a $60 USD per person onboard credit to use during your cruise. Wake up at SANTA CRUZ for a visit to the white-sand beach of Las Bachas. Here your Naturalist points out various seabirds, flamingos, marine iguanas, and sea turtles. This is also a great place for snorkeling. Next, cruise to SANTIAGO and Puerto Egas, once a buccaneer supply base. Watch for Galápagos hawks, Darwin’s finches, land and marine iguanas, and Sally Lightfoot crabs. You will also encounter a Galápagos fur seal grotto, one of the few places in the archipelago where fur seals can be seen. From here you can swim and snorkel in search of octopus, sea horses, starfish, and other sea life. Upon arrival at GENOVESA Island, your visit to Prince Philip’s Steps begins with a scenic panga ride along the cliffs to see the large number of shore and seabirds nesting in the cliffs’ ledges. Disembark at the base of Prince Philip’s Steps and climb up the stairs to a trail where birdlife abounds. A walk with your Naturalist reveals large colonies of masked boobies, blue-footed boobies, frigate birds, storm petrels, and even short-eared owls. In the afternoon, disembark at DARWIN BAY to observe thousands of birds—mainly frigatebirds, red-footed and masked boobies, gulls, herons, finches, and mockingbirds. Return to the beach for swimming and snorkeling while looking for colorful tropical fish, golden rays, and, hopefully, some hammerhead or Galápagos sharks. Today begins on NORTH SEYMOUR, where sea lions and marine iguanas hang out next to the rocks. The interior has a Palo Santo and small Opuntia forest with blue-footed boobies and magnificent frigatebird colonies. Next up: SANTA CRUZ, where vegetation ranges from cactus to rainforest. This island supports the largest population of giant tortoises after Isabela – here, your Naturalist takes you to a giant tortoise reserve where you can observe these impressive creatures in their natural surroundings. After breakfast, visit the Galápagos National Park INTERPRETATION CENTER on San Cristóbal to learn more about its ecosystems, flora, and fauna as well as the great emphasis on conservation. While here, watch for the Chatham mockingbird and Chatham lava lizard—both species are endemic to this island and seen nowhere else in the Galápagos. Later, head to the airport for your flight to Guayaquil. Overnight in Guayaquil. Your vacation ends with breakfast this morning before departure for the aiport for your flight home. Take your family on a cultural and exciting adventure with this nine-night escorted tour. Starting in Lima and ending in Cusco, you and the kids can enjoy a journey full of history, wildlife, and beautiful scenery. This is the perfect adventure for active families, especially with teenagers. 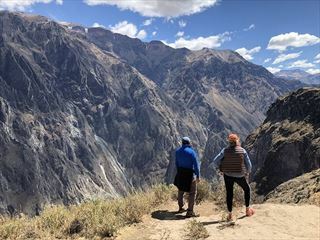 This 13-night tour journeys along the sacred Inca Trail, offering history, culture, and plenty of activities, including camping, hiking and cycling.